Coatings which employ organic solvents can be applied over a wide range of temperatures, including cold or marginal weather conditions. Moreover, they will dry quickly under conditions of high humidity since the rate of solvent evaporation is not related to relative humidity. These advantages are offset to some degree, however, because they contain large percentages of usually flammable, and sometimes highly toxic, organic solvents. Additionally, many of these coatings are required to carry the D.O.T. classified "red label" associated with low flammability flash point. This means the applicator must exercise care and prudent handling procedures when transporting, storing, and applying such coatings. Also, since these systems contain organic solvents which may soften certain asphalt and other conventional roofing materials, they may cause "bleed through" problems or, even worse, permanent damage to the old roofing substrate. Rooftop air intakes must be masked to prevent vapors from entering the HVAC and ventilation systems. Finally, when using these materials, additional solvent is required to clean the application equipment after use. In contrast, water-based coatings eliminate the flammability and potential toxicity hazards associated with solvent systems since they use water-rather than solvent-as the carrier. Additionally, the equipment used can be easily cleaned with soap and water, and their potential for "bleed through" is significantly lower because they do not contain solvents. Since water is an inexpensive solvent, cost is usually lower than solvent-based coatings. The chief limitation of water-based coatings is the range of atmospheric conditions conducive to application. First, they should not be applied at temperatures too close to freezing because the rate of water evaporation becomes so slow they may not dry properly. Normal low cut-off point for application of these coatings is 50 degrees F. Second, they should not be applied when rain or inclement weather is imminent. Considerable progress in narrowing this application conditions gap between solvent- and water-based coatings has been made with a recent introduction to the marketplace of systems with "quick set" properties. National Coatings AcryShield A600 and A640 have this property and can adequately withstand heavy dew or light rain shortly after application. 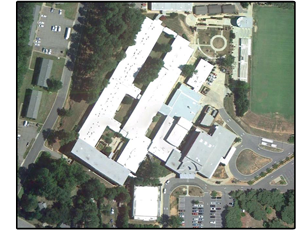 The third, less common type of roof coating consists of 100 percent solids. Since these coatings contain virtually no solvents, they do not possess the limitations of the water- or solvent-based coatings. However, they do require special application equipment and are extremely sensitive to changes in application temperature as their ability to form a durable, long-lasting membrane is dependent on proper mixing ratios of the two components and reaction temperature. If incorrect, the coating may not adequately cure or may, possibly, gel prematurely, thus preventing the protective membrane from forming properly. 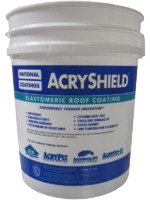 Acrylic roof coatings take advantage of the inherent durability of acrylics, and can be designed to be very elastic and flexible over a wide temperature range for a relatively modest cost. In addition, they are supplied as either water- or solvent-based products, although specialized acrylic coatings are available for roofs experiencing ponded water conditions. For more information on roof coatings – download our FREE Brochure! AcryShield A502 was introduced by National Coatings Corporation in 2006 after three years of intensive research, including both laboratory and actual in-service field testing. The coating was designed to provide a primer/base coat to be applied to thermoplastic and thermoset single ply membranes, such as PVC, PIB, CPE, TPO and EPDM. Previously, the only primers used for coating these membranes were solvent borne, which required warning labels, had very high VOC (volatile organic content) and required extreme care when applying to prevent fumes from entering the building. The only other option for coating EPDM was a "prewash" or "rinseable primer" that had a very high, corrosive pH, so high that it would react with human skin oils, causing chemical burns. It is water borne, so there is no concern about flammable solvents or fumes entering buildings. 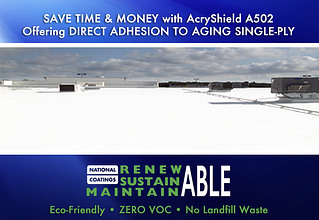 The next time a project calls for coating single-ply roofing membranes, the roofing contractor, consultant or specifier should demand National Coatings Corporation AcryShield A502.